Dame Ellen MacArthur is a very popular speaker. Her passion for sailing and her determination to take on the world’s oceans alone has inspired many – not least because she has achieved so much so young. Ellen was a land-locked Derbyshire girl who knew at the age of ten that she wanted to sail. Her skill and bravery has led to remarkable feats already and she was recently honoured with the title of ‘Yachtsman of the Year’. An inspirational and courageous young woman. In February 2005 Ellen MacArthur was welcomed back to Britain by huge crowds after sailing solo around the world in record time. In recognition of this amazing feat she was made a Dame. Ellen’s drive and determination are awe-inspiring, thousands follow her race progress on the Internet and hoards of people flock down to the quayside to see her off on a race. Ellen’s record is a feat of mammoth endurance, speed and sheer physical and mental willpower in the face of overwhelming adversity. When 26-year-old Ellen Macarthur became the fastest woman to sail around the world, it was the culmination of years of hard work and determination. Ellen’s passionate relationship with sailing began when she was eight and stepped aboard her aunt’s boat to go sailing on the East Coast. For a petite child growing up in Whatstandwell in land-locked Derbyshire, it was an exciting new experience – and it would turn into a lifelong obsession. Over the next few years, Ellen saved as much money she could to buy her first boat, an 8ft dinghy. She admits becoming ‘a geek’ spending nearly all her time reading sailing books at local libraries and trying to learn as much about the subject as possible. Ellen’s plans of becoming a vet hit the buffers thanks to a bout of glandular fever whilst in the sixth form, so she resolved instead to become a professional sailor. Her career started with Ellen sailing single-handedly around Britain – an achievement which brought her the title of BT/JYA Young Sailor of the Year. She also passed the Yachts-master Offshore Qualification with the highest possible marks in practical and theory examinations. Things were going well. Despite such promise, Ellen found it hard to attract sponsorship to take her career to the next stage. Out of 2,500 letters to potential sponsors, she received just two replies. In fact, she was so poor she had to make her home a Portokabin during this desperate time! Eventually, Ellen managed to raise enough money of her own steam to buy a used 21-ft Classe Mini. She refitted the boat and raced it alone across the Atlantic in the 1997 Mini Transat race, completing the 2,700-mile journey in 33 days. This achievement brought sponsorship from the giant retail group Kingfisher who funded her move to an Open 50 yacht which she entered in the gruelling Route Du Rhum race in 1998. A strong effort from Ellen saw her finish first in her class and fifth overall – a performance which led to her being named BT/JYA Yachtsman of the Year. It was also at this time that French sailing fans took Ellen to their hearts, giving her the official title ‘Sailing’s Young Hope. Since then, Ellen has enjoyed huge support in France, where sailing has a much bigger following than in England. Kingfisher were impressed and backed Ellen to the tune of £2 million to enter the 2000/01 Vendee Globe with a brand new Open 60 boat – or Kingfisher as it was more commonly known. This was another moment of truth for Ellen. If she did well, it would undoubtedly give her career a further boost, but if she failed it could set her back years. She needn’t have worried. As before, Ellen exceeded all expectations in the challenge. Those who had predicted the 5ft slip of a girl would struggle against muscular male opponents were silenced as Ellen finished the challenge ahead of all but one of her male counterparts – making headlines around the world. 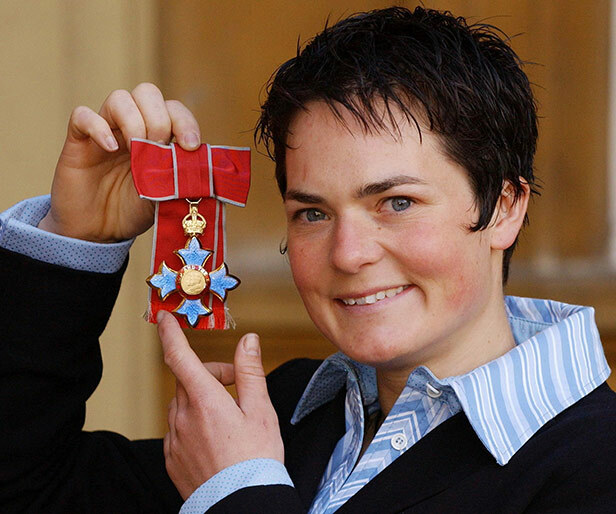 Her achievements led to recognition in one of the most prestigious sport awards – she was voted second in the BBC Sports Personality of the Year 2001, an incredible achievement considering the awards are usually dominated by more mainstream sports. But Ellen wasn’t finished. In November 2002, she tackled the gruelling Route du Rhum once again – this time finishing first and breaking a number of records on the way. Not only was she the first woman to sail to victory in the race, she also captained the first monohull to cross the line. Please complete the following form to enquire about booking Dame Ellen MacArthur.